The Long Canyon Slot trail is located in the Grand Staircase-Escalante National Monument east of Boulder, Utah on the Burr Trail Road. The trail is on the list of short day hikes on the GSENM website. Although not as narrow as many of the popular slot canyons that a normal sized adult can barely squeeze through this short canyon does give visitors some of the same feelings of being surrounded by high cliffs in a confined environment. To get to the unmarked trailhead travel 11 miles east of the town of Boulder on the Burr Trail Road. The Burr Trail Road makes a very dramatic descent into Long Canyon about 9 miles from Boulder. You will find a pullout on the north side of the road less than a mile after crossing Steep Creek at the west end of Long Canyon. Google Maps gives the total distance as 11.4 miles. The narrow slot canyon can be seen across the wash from the pullout. Follow the trail down into the wash from the parking area. The mouth of the canyon is shaded with many small cottonwood trees. Right when it starts getting fun the short trail comes to an abrupt end and alas it is time to turn around. By complete chance we happened to be here during the brief period each day when the canyon is illuminated by the sunlight. Long Canyon itself is a beautiful scenic drive. The Burr Trail Road travels through it for about 5 miles. 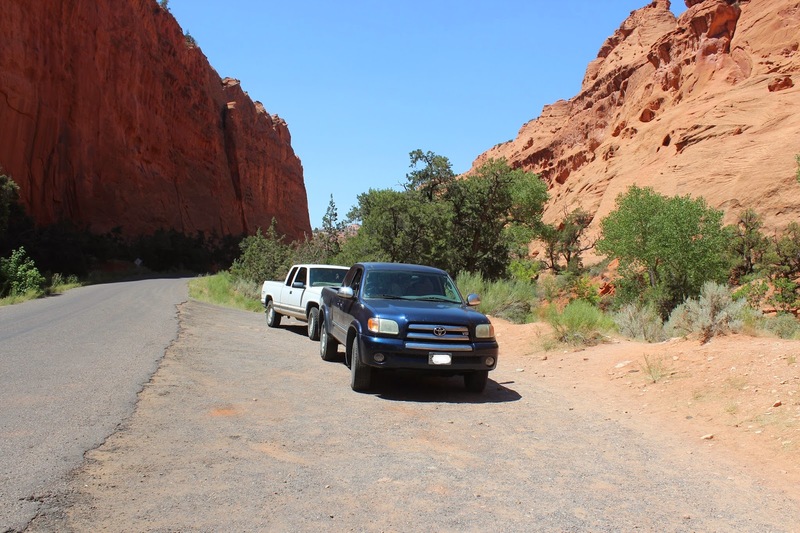 It is possible to continue east on the Burr Trail Road and end up eventually at the Bullfrog Marina on Lake Powell or at Norton near the Capitol Reef National Park. We don't have any firsthand experience to share about those routes. The Long Canyon Slot is worth stopping at if you happen to be traveling through the area. If you would like to see it for yourself then all you have to do is 'Take a hike'.